Were you ever paid for good grades when you were a kid? I was reminded of my elementary years when I read about the good grades reward program that Discover is offering to students. When I was a kid I didn’t have many ways to earn money so the $5 an A that my parents paid me definitely motivated me to earn good grades. 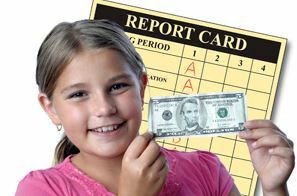 Our report cards came home four times a year so it was a chance for me to earn $160 over the course of a school year. I worked really hard to make sure I could get all A’s. If I got a B I wasn’t worried about getting in trouble from my parents, I was upset with myself because I didn’t get as much money. I know there is a big debate about whether you should pay your kids for grades. The main argument is that you want the kids to be motivated to learn by something other than money. As parents we would prefer intrinsic motivation. We want our kids to learn because they want to know more. I think it really comes down to each individual family and kid. It’s up to the parent to decide whether it is a good approach for their family. As I mentioned, my memory was jogged by the program that Discover is offering called the Good Grades $20 Cashback Bonus. It’s a little different than my elementary school experience because you have to be at least 18 to apply for a credit card. The motivation factor for older students is different than it was for me in elementary school. I was determined to earn reward money for my grades because I didn’t have a lot of ways to bring in money as a kid. When you’re in your late teens and twenties you can go get a job since it’s hard to get approved for a credit card if you don’t have a source of income. In addition, students in college are motivated to get good grades by much bigger goals than simply cash. Serious students know that getting good grades can mean more money in scholarships and eventually more looks from potential employers when they send out their resumes. Students who qualify for the Good Grades Cashback Bonus aren’t going to be motivated to do well simply because of the reward. However, I remember the days of being a broke college student and how every dollar seemed precious. When you’re counting your pennies, $20 would be a nice little boost. The way the Good Grades Reward works is that every school year if the student has a 3.0 or above GPA they get a $20 credit applied to their Discover credit card account, up to five years max. I had a credit card when I was in college and it helped me build up a credit history I could use after I graduated. Of course, I paid my credit card balance off each month. It doesn’t make financial sense to use a credit card if you’re going to carry a balance. If I had a kid with a credit card I’d want access to their credit card balance just so I could make sure they were being sensible with the use of their card. For students who can use a credit card responsibly, the Discover’s Good Grades bonus is a nice perk to consider when deciding which card to use. Discover already offers student cash back cards and this $20 bonus works the same way as Cashback, it’s applied towards the balance of the bill. Here are the details of the new program. What are your thoughts on rewarding students for good grades with money? Did you get paid for grades as a kid?